SCREEN Develops De Facto Standard 8-Page CtP Systems | SCREEN Graphic Solutions Co., Ltd.
Kyoto, Japan - August 20, 2018 - SCREEN Graphic Solutions (SCREEN GA) has completed development of its PlateRite 8600NII series of 8-page thermal CtP systems. These systems are equipped with high-output fiber laser diode exposure heads, enabling outstanding productivity of up to 32 plates per hour1 as well as superior cost performance and energy savings. The series will be released in the international market at the end of August. In recent years, there have been increasing calls for greater cost reduction and cost performance in offset printing. Similar demands have also been growing in relation to CtP, where lower investment and running costs plus higher productivity and energy savings are required, in addition to, of course, higher quality. In response to these needs, SCREEN GA has developed its PlateRite 8600NII series. 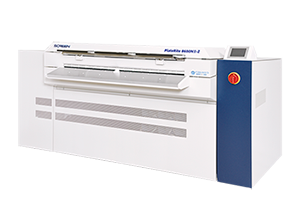 The systems have further improved the excellent cost and environmental performance offered by the original PlateRite 8600N series, which has built an impressive sales record since it was first released in 2009. All PlateRite 8600NII models feature the latest fiber laser diode exposure heads. These heads work with SCREEN GA's proprietary clamp technologies and auto-balance mechanism to enable stable, high-speed exposure with top quality. The lineup includes the Z, S and E models, allowing printing companies to choose the right type for their production requirements. The Z model is equipped with 96 channel exposure heads, supporting output of up to 32 plates per hour. The S and E models have 64 and 32 channel heads respectively, for outputs of 24 and 14 plates per hour. All systems are capable of handling plate sizes ranging from as large as 1,160 x 940 mm (45.6" x 37") to, when fitted with the small size option, as small as 304 x 370 mm (12" x 14.6"). In addition, the specifications of each model can be minimized to further reduce initial investment, and in-service upgrades can easily be applied after installation. It is also possible to fit an MA-L8900 multi-cassette autoloader, providing automatic supply of up to 600 plates.2 The MA-L8900 enables extended periods of continuous operation that significantly reduce operator requirements while improving productivity and press operating ratios. All models feature major functionality improvements that produce energy savings of around 60% during operation3 and 73% during standby,3 as well as a power-saving mode that reduces energy consumption during idling. This is just one example of how the series has been carefully designed to further reduce its environmental impact. It is also backed by SCREEN GA's TRUST Network Service, a cutting-edge online maintenance and support package that enhance the operational stability of the systems. SCREEN GA intends to use its position as a world leader in the CtP field to continue delivering products that answer the market's evolving needs. SCREEN GA is confident that these efforts will help to support the development of the overall printing industry. 1. For the PlateRite 8600NII-Z model with 1,030 x 800 mm (40.5" x 31.4") plates. 2. For plates of 0.24 mm thickness. 3. A comparison of the PlateRite 8600 and PlateRite 8600NII-Z when used as standalone systems. The test involved imaging high-sensitivity material of 1,030 x 800 mm (40.5" x 31.4") at 2,400 dpi. As power consumption is also affected by the operating environment and other external factors, the above values cannot be guaranteed. Information contained in the news release are current on the date of publication, but may be subject to change without notice.